There won't be any dust bunnies building up under the Amish Christy Side Rail Storage Unit. 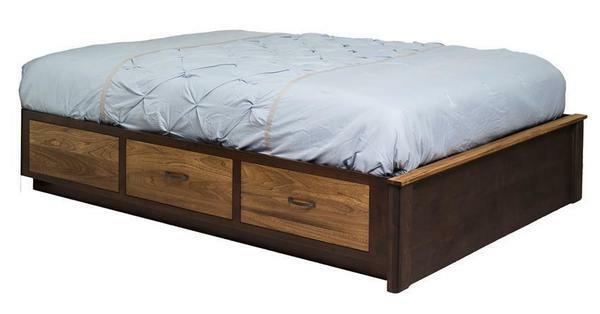 This gorgeous platform bed brings extra storage right along with it with spacious side drawers offering plenty of room. Keep clutter at bay with a solid wood bed that provides comfort, style and the extra storage you're looking for. The Christy is shown here in an attractive combination of grey elm wood and brown maple wood. Create a gorgeous set of transitional style bedroom furniture by adding the Amish Christy One Drawer Nightstand and the Amish Christy Seven Drawer Chest.